Conservationists are increasingly being asked, “how does your work change when you consider climate change?” The Wilderness Society has been working with new datasets on climate change predictions with other mapped data on landscape values (wildness, connectivity, and biodiversity) to help guide their conservation strategies. Undeveloped natural areas—also known as wildlands—are essential for the health and sustainability of the environment and all the ecosystems and wildlife they support. Benefits from wildlands include habitat for diverse plant and animal species, water and air purification, and quiet outdoor recreation for people. Conserving wildlands and their assets has been an important conservation goal for decades. Historically, conservationists have focused on protecting plants and animals within reserves such as national parks and wilderness areas. They also work to restore degraded lands that might be missing key features or species. For example, conservationists have worked to re-establish open, park-like forests of ponderosa pine, and reintroduced wolves to Yellowstone National Park. However, climate change and some other problems—invasive species, for instance—cross reserve boundaries and create moving targets for restoration, leading many ecologists to rethink traditional conservation strategies. Wilderness advocates and many conservation scientists have long held that nature can take care of itself. They assert that a “hands off” strategy may be the best way to maintain all of nature’s diversity. Impacts related to climate change, though, are causing some to question that idea. Can nature take care of itself as conditions change, or when exotic species such as hemlock adelgid, gypsy moths, cheatgrass, or kudzu invade? Or must we intervene and manage nature? Restoration ecologists who work to restore degraded lands sometimes struggle to establish benchmarks. What does “restoration” look like in the age of climate change? What targets should they set? Many efforts aim to re-establish the specific suite of species that existed at a site before humans developed lands, harvested species, introduced exotics, and dammed rivers. However, some ecologists argue that a historical target for restoration is no longer valid as climate changes. After all, it makes little sense to attempt to restore species to areas in which they can no longer survive. These ecologists suggest that we should plan for the future instead; they recommend planting species suited to the projected climate conditions of tomorrow. 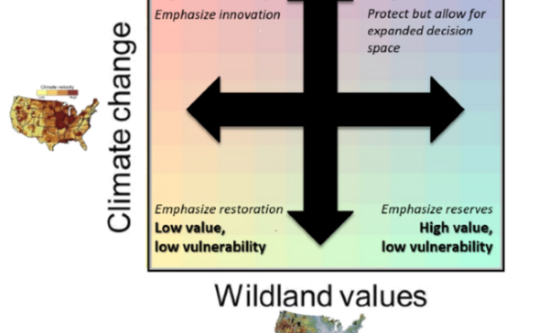 Working with data sources from AdaptWest and others, ecologists at The Wilderness Society conducted a national assessment of conservation values and climate change vulnerability. Their goal was to determine where to emphasize certain strategies—from wilderness protection to novel restoration approaches—based on the existing conditions of the land as well as projected future climate conditions. The first step was to map gradients in wildlands conservation values. The Wilderness Society’s wildland conservation value assessment identifies the wild places that connect large protected areas and represent a comprehensive range of ecosystems and rare species. The analysis can help identify conservation priorities and provide a quantitative estimate of land’s existing value to establishing a connected system of resilient conservation reserves. The second step was to map climate vulnerability. For this step, TWS relied heavily on the AdaptWest data. AdaptWest is a data clearinghouse and source of useful information to help conservationists with climate adaptation planning. Using AdaptWest data, TWS mapped predictions in future climate, as well as estimates of multivariate climate velocity (the distance needed to track climate shifts in the future). 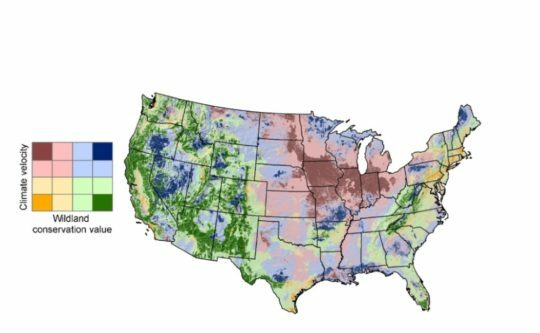 Finally, TWS mapped wildland values and climate vulnerability together to represent gradients of vulnerability simultaneously with gradients of wildland values. In other words, their map evaluates lands that are low value/low vulnerability, low value/high vulnerability, high value/low vulnerability, and high value/high vulnerability. 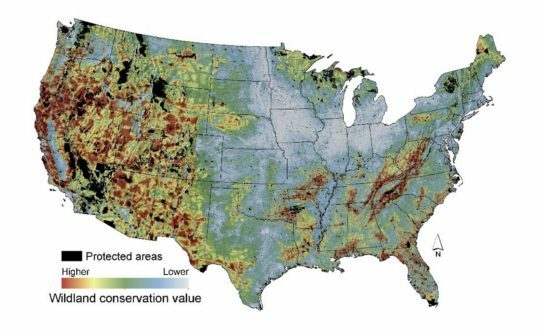 Their map can help conservation practitioners decide where to emphasize restoration, innovative restoration, and protection in reserves. In other words, the combined information can help conservationists decide where to implement which conservation strategy within their portfolios of options. Where might restoration with a target of establishing a historical range of variability still be appropriate? Where might more innovative restoration work be most appropriate? Where would traditional hands-off conservation reserves be important strategies? Where should conservation reserves that provide for added management flexibility be needed? TWS’s analysis provides a framework and map to help guide these decisions. 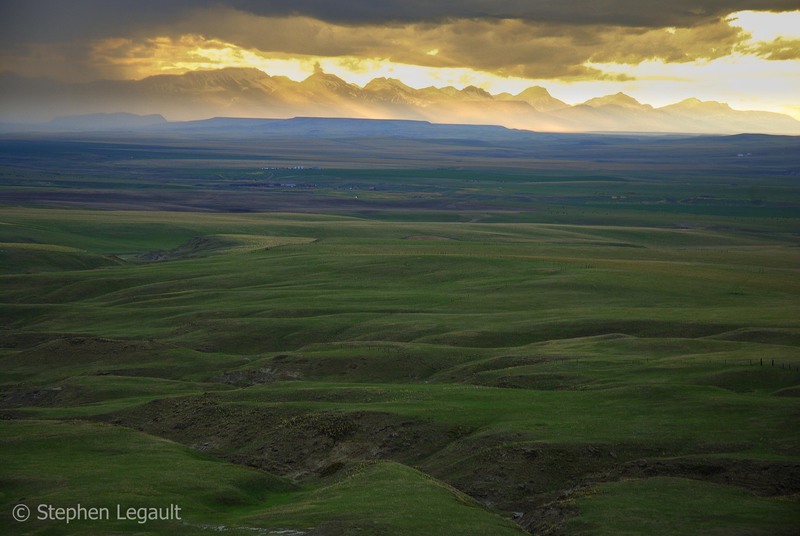 The national assessment identifies priorities for traditional conservation strategies, recommending where to protect, connect, and restore wildlands. By incorporating climate change models, the approach can also identify where to emphasize different climate adaptation strategies and where to spread risk among multiple strategies. This approach can help foster a national wildlands system that’s more prepared to handle the projected consequences of climate change. Ultimately, this work provides a framework and demonstration maps to aid conservation decisions for climate adaptation. However, implementation of these ideas requires convening inter-disciplinary scientists, diverse stakeholders, and various land management agencies to help make better decisions. Aycrigg, J. L., A. Davidson, L. K. Svancara, K. J. Gergely, A. McKerrow, and J. M. Scott. 2013. Representation of Ecological Systems within the Protected Areas Network of the Continental United States. PLoS ONE 8:e54689. Aycrigg, J. L., C. Groves, J. A. Hilty, J. M. Scott, P. Beier, D. A. Boyce, D. Figg, H. Hamilton, G. Machlis, K. Muller, K. V. Rosenberg, R. M. Sauvajot, M. Shaffer, and R. Wentworth. 2016. Completing the System: Opportunities and Challenges for a National Habitat Conservation System. BioScience 66:774–784 . Carroll, C., J. J. Lawler, D. R. Roberts, and A. Hamann, 2015: Biotic and Climatic Velocity Identify Contrasting Areas of Vulnerability to Climate Change. PLoS ONE 10: e0140486. Jenkins, C. N., K. S. Van Houtan, S. L. Pimmc, and J. O. Sexton, 2015: US protected lands mismatch biodiversity priorities. Proceedings of the National Academy of Sciences of the United States of America, 112: 5081–5086. Theobald, D. M. 2013. 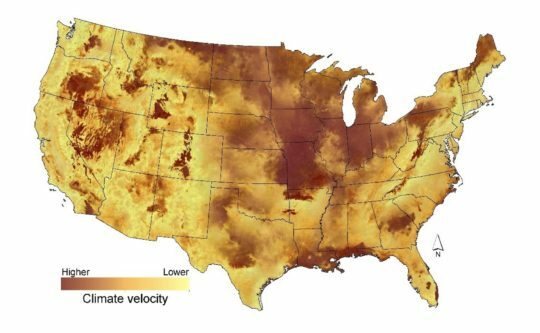 A general model to quantify ecological integrity for landscape assessments and US application. Landscape Ecology 28:1859–1874.